Michael Bloomberg has come out for Barack Obama. The backing of the mayor of New York City is important for the president. Mr Bloomberg started out life as a Democrat, ran and won twice as a Republican, then left his party to become an independent in 2007. He didn't back either candidate in 2008. In his endorsement, he tentatively nods towards Mitt Romney's economy policies: "I believe Mitt Romney is a good and decent man, and he would bring valuable business experience to the Oval Office. He understands that America was built on the promise of equal opportunity, not equal results." But in the wake of Sandy, he says it is the environment - specifically the threat of climate change - which decides him for Mr Obama. "While the increase in extreme weather we have experienced in New York City and around the world may or may not be the result of it, the risk that it might be - given this week's devastation - should compel all elected leaders to take immediate action." Mr Bloomberg says the president has taken "major steps" to reduce the US carbon consumption, including new fuel-efficiency standards for vehicles. And he says Mitt Romney has abandoned his previous beliefs on climate change. 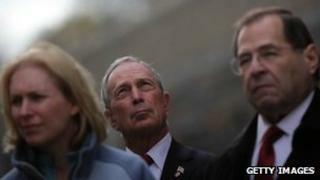 Mayor Bloomberg said: "He has reversed course, abandoning the very cap-and-trade programme he once supported. This issue is too important. We need determined leadership at the national level to move the nation and the world forward." He says he is also worried by Mr Romney's anti-abortion and anti-gay marriage positions, but says Mr Obama hasn't done enough to build consensus but must try again. "If he listens to people on both sides of the aisle, and builds the trust of moderates," Mayor Bloomberg said, "he can fulfil the hope he inspired four years ago and lead our country toward a better future for my children and yours. And that's why I will be voting for him." Does this matter? It might. I've met a surprising number of voters who say they can't make up their minds. Some, I think, are merely expressing an odd respect the democratic process - they don't want to look as though they are being hasty or ill-considered. But some are genuinely torn. They like Mr Romney's business background but are less impressed with his more conservative beliefs not related to economics. Mayor Bloomberg might make a difference for some of them. It is hard to know whether such endorsements really change minds. I am not sure that stump speeches do either. But the candidates' frantic schedule, dashing from rally to rally, suggests they think it matters. In such a close election, every little helps.